For Wikipedia's CJK template, see Template:CJKV. 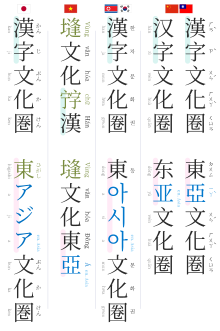 For help with CJK character display, see Help:Multilingual support (East Asian). CJKV characters derived from Ancient Chinese characters. Left to right: Japanese, Vietnamese, Korean, Simplified Chinese, Traditional Chinese. In internationalization, CJK is a collective term for the Chinese, Japanese, and Korean languages, all of which include Chinese characters and derivatives (collectively, CJK characters) in their writing systems. Occasionally, Vietnamese is included, making the abbreviation CJKV, since Vietnamese historically used Chinese characters as well. Collectively, the CJKV characters often include hànzì in Chinese, kanji, kana in Japanese, hanja, hangul in Korean, and hán tự or chữ nôm in Vietnamese. Chinese is written almost exclusively in Chinese characters. It requires over 3,000 characters for general literacy, but up to 40,000 characters for reasonably complete coverage. Japanese uses fewer characters — general literacy in Japanese can be expected with 1,945 characters. The use of Chinese characters in Korea is becoming increasingly rare, although idiosyncratic use of Chinese characters in proper names requires knowledge (and therefore availability) of many more characters. However, even today, students in South Korea are taught 1,800 characters. Other scripts used for these languages, such as bopomofo and the Latin-based pinyin for Chinese, hiragana and katakana for Japanese, and hangul for Korean, are not strictly "CJK characters", although CJK character sets almost invariably include them as necessary for full coverage of the target languages. Until the early 20th century, Classical Chinese was the written language of government and scholarship in Vietnam. Popular literature in Vietnamese was written in the chữ Nôm script, consisting of borrowed Chinese characters together with many characters created locally. By the end of the 1920s, both scripts had been replaced by writing in Vietnamese using the Latin-based Vietnamese alphabet. The sinologist Carl Leban (1971) produced an early survey of CJK encoding systems. The number of characters required for complete coverage of all these languages' needs cannot fit in the 256-character code space of 8-bit character encodings, requiring at least a 16-bit fixed width encoding or multi-byte variable-length encodings. The 16-bit fixed width encodings, such as those from Unicode up to and including version 2.0, are now deprecated due to the requirement to encode more characters than a 16-bit encoding can accommodate—Unicode 5.0 has some 70,000 Han characters—and the requirement by the Chinese government that software in China support the GB 18030 character set. Although CJK encodings have common character sets, the encodings often used to represent them have been developed separately by different East Asian governments and software companies, and are mutually incompatible. Unicode has attempted, with some controversy, to unify the character sets in a process known as Han unification. CJK character encodings should consist minimally of Han characters plus language-specific phonetic scripts such as pinyin, bopomofo, hiragana, katakana and hangul. The CJK character sets take up the bulk of the assigned Unicode code space. There is much controversy among Japanese experts of Chinese characters about the desirability and technical merit of the Han unification process used to map multiple Chinese and Japanese character sets into a single set of unified characters. All three languages can be written both left-to-right and top-to-bottom (right-to-left and top-to-bottom in ancient documents), but are usually considered left-to-right scripts when discussing encoding issues. Libraries cooperated on encoding standards for JACKPHY characters in the early 1980s. According to Ken Lunde, the abbreviation "CJK" was a registered trademark of Research Libraries Group (which merged with OCLC in 2006). The trademark owned by OCLC between 1987 and 2009 has now expired. DeFrancis, John. The Chinese Language: Fact and Fantasy. Honolulu: University of Hawaii Press, 1990. ISBN 0-8248-1068-6. Hannas, William C. Asia's Orthographic Dilemma. Honolulu: University of Hawaii Press, 1997. ISBN 0-8248-1892-X (paperback); ISBN 0-8248-1842-3 (hardcover). Lemberg, Werner: The CJK package for LATEX2ε—Multilingual support beyond babel. TUGboat, Volume 18 (1997), No. 3—Proceedings of the 1997 Annual Meeting. Leban, Carl. Automated Orthographic Systems for East Asian Languages (Chinese, Japanese, Korean), State-of-the-art Report, Prepared for the Board of Directors, Association for Asian Studies. 1971.